Why is there a picture of a coffee mug in today’s post? Oh, this isn’t just any old coffee mug. This is a symbolic and wonderous coffee mug. Allow me to explain…. On this day six years ago, I met this guy. I was told I simply had to meet this guy – he was funny, intelligent, sarcastic and handsome. He sounded pretty fantastic, so I went on the date. A date which turned into a whole weekend of awesome, which I have to tell you was quite the relief. I’d had such horrid luck in the dating department up until now, I was really starting to wonder if I should just quit altogether. The gentleman in question left on the Sunday, but invited me to visit him on the following weekend. First, I wondered if he would actually call – I mean, you know how that stuff goes. And then, when he did call, I wondered if I still liked him. I mean I knew I liked him, but what if I had built him up in my head, you know? Was he really that fantastic? Hmmm. As Thursday drew near, I began to worry. I mean, what if he was crazy? I tend to only attract crazy after all. And was I really going to go spend a weekend with someone I barely knew in a town I barely knew? Eep. Thursday arrived and my gentleman showed up at the door to pick me up (point for saving me the bus ride into H.). When I opened the door, I was instantly ridiculously happy. He was a) wearing a ‘Republicans for Voldemort’ t-shirt, b) carrying two coffees from my favourite local coffeehouse, and c) crazy hot. Phew! Yes, yes Ezmy, but where does the mug come in? Right, so the mug was actually purchased that weekend. On the Saturday, I believe. Thursday was a wicked concert date with the gentleman and his friends, who were all awesome and super friendly (JE made me feel so at home, I didn’t want to leave). Friday was another great day (coffee, chatting, newspapers, long walks) and another night out with more awesome friends (RP and MC and EH and oh so many wonderful folks). By Saturday, I was saturated with feelings of awesomeness. These people were lovely, this man was lovely, this town was lovely. As we set out for another super fun adventure, I saw this coffee mug in the window of a drug store and thought “I love that mug. And you know what? I want it!” I told the gentleman I simply had to go inside, to which he replied, “Sure!” and happily joined me. No moaning about having to be somewhere or rolling his eyes over a silly whim. SO REFRESHING! I purchased the mug for $5. And almost three months later, I unpacked that same mug and put it in the cupboard of my first apartment with A., alongside his graduation mug. My man, he is the greatest. Best six years ever. Aww that is such a great story made even better because I know both of you. This reminds me of my first date weekend with Mat when we were eating ice cream cones in his car on the drive back from Sooke Potholes and I just had a little bit left and I said I couldn’t eat any more and he said, well just throw it out the window and so I just did. 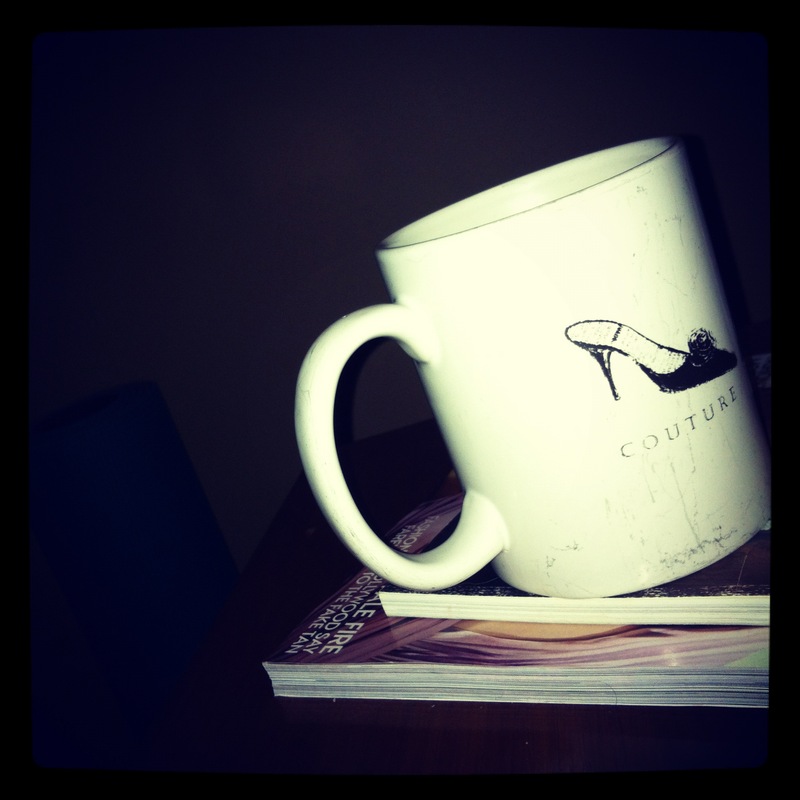 Symbolic, like the mug, but I think meeting the right person frees you up in so many ways. (Not that you should really throw ice cream out of a moving car…). Anyway. Congratulations on six years!